So this past weekend we had a pretty good size snow storm that brought us about 5-6 inches of snow. We did go out in this weekend, but I was bundled up as I usually am. This morning I wake barely able to swallow because my throat felt so dry. I thought it was because of how hot it was in our bedroom from the heat. WRONG. and go straight to bed to get warm under the covers. My hands right now feel ice cold and my cheeks feel like they are on fire! I have some antibiotics left from the last time I was sick (please don't yell at me, I know I am suppose to finish all of them but I forgot one day then the next so I just stopped. But they sure will come in handy now to maybe make me feel a little better!) so I'll take those too. Hopefully my body aches will go away and my head stop hurting and my cheeks will resume to normal body temperature! What a happy Monday to me huh? Hope you're feeling better before Christmas! Feel better! 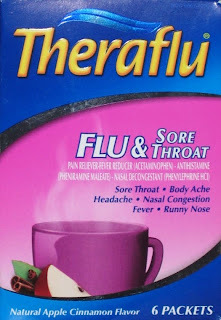 The Theraflu always helps for me, hopefully it will warm you up a little. I am certain you are better off not taking the antibiotics. Your body becomes more resistant to them when you 1) stop taking them and/or when you 2) take them when unnecessary, so you could potentially do yourself harm. The flu is a virus anyway, which are untreatable with antibiotics. Anyways, I'd just stick to the Theraflu and go to your doctor for a new Rx if you don't feel better in a day or two, or if you continue to run a fever for more than 24 hours. Take care! Oh no!! Get better :) Thanks for follwing me! When was your wedding date? I am a newlywed and blog about Life as a Wife! Merry Christmas!